Vignoles is our Season Feature for March and April 2019. Pronounced vin-yolz; the “g” is silent. A semi-sweet white wine with a hint of pineapple. Excellent with baked ham, sweet/sour dishes, Havarti cheese. For those who like Riesling. 89% Vignoles, 11% Cauyga. Estate Bottled . 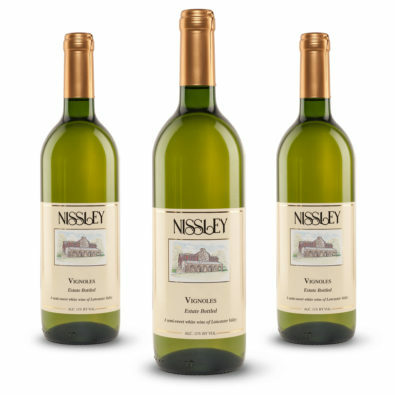 Currently available for tasting and purchase in all Nissley wine shops. Also available by UPS delivery in PA. Regular price: $13.90. Featured price: $11.12 when you buy 1-11 bottles. Note: Every two months, we feature one wine at 20% off when you purchase 1-11 bottles. The price is not eligible for quantity discounts, and the wine is not available for personalized wine orders at this price. More specials will be presented here from time to time.